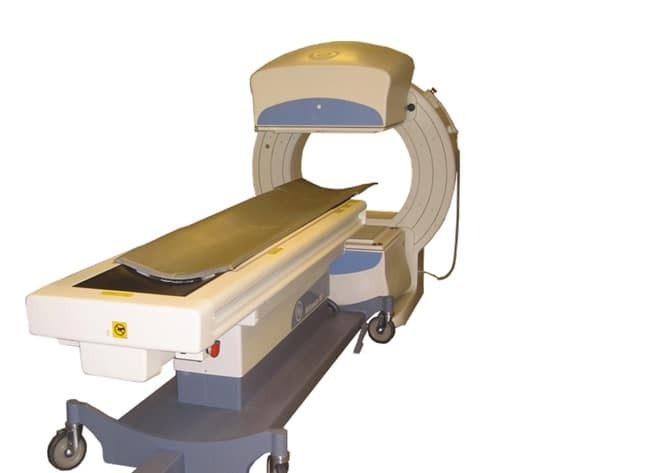 The GE Millennium® MG is a modular, general purpose imaging system capable of static, dynamic, whole body (WB), multi-gated cardiac, tomographic, and gated tomographic nuclear medicine procedures. The MG gantry allows the detectors to be oriented in the 180° and 101.25° orientations. The other modular core components of the Millennium® MG family include a 3-axis universal imaging table, a GENIE® Acquisition station, dual Digital CSE™ detectors, and high-performance collimators. The Millennium® MG features optional real-time body-contoured SPECT whole body scans, as well as ACuscan, an optional transmission attenuation correction system for SPECT and Gated SPECT scans.